The Mount Dora Lighthouse is located on Lake Dora, at the tip of Grantham Point, only blocks from quaint and quiet Mount Dora, Florida. 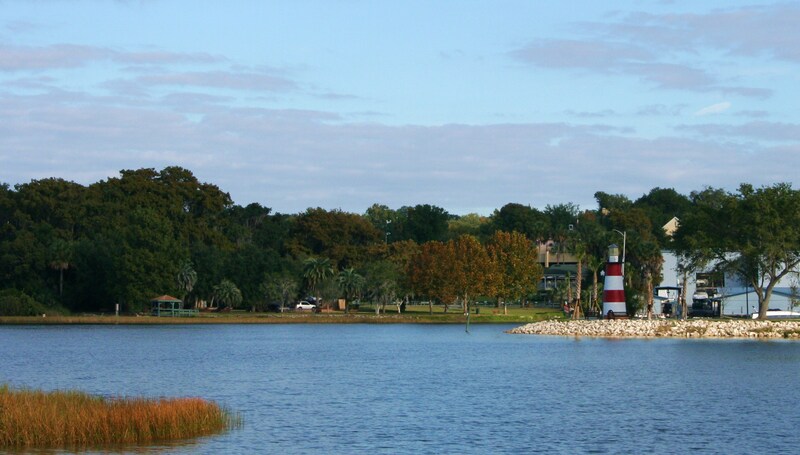 The Mount Dora Lighthouse is a 35 foot tall stucco covered, brick structure. It is one of only three freshwater lighthouses in the State of Florida. 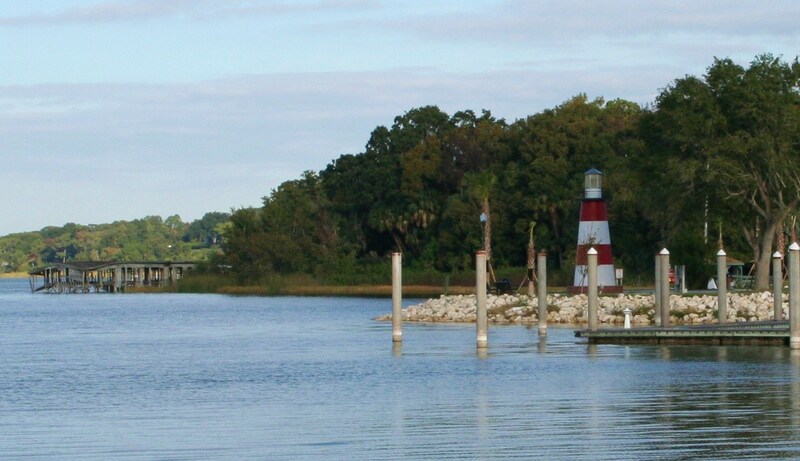 The Mount Dora Lighthouse is an active lighthouse, providing navigational aid to inland boaters. 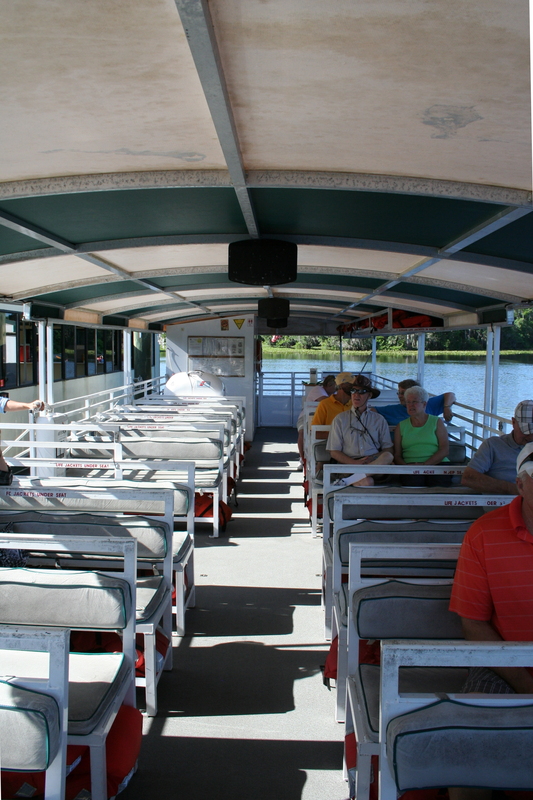 If you are a nature enthusiast, birder or photographer, a leisurely cruise through the backwaters of the historic and scenic St. Johns River will prove music to the ears and a feast for the eyes. 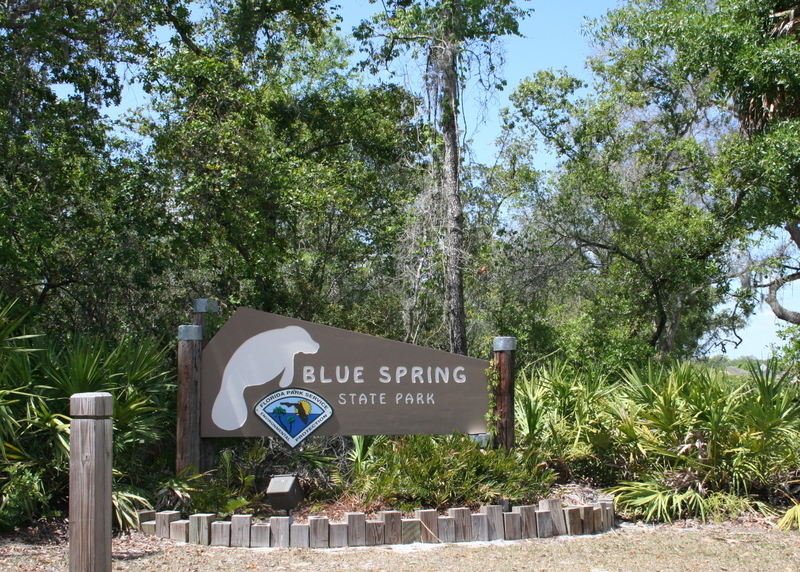 There are a number of ecotours available along the St. Johns River, including St. Johns River Cruises located within Blue Springs State Park, Orange City, Florida. Tours are offered daily at 10:00am and 1:00pm. 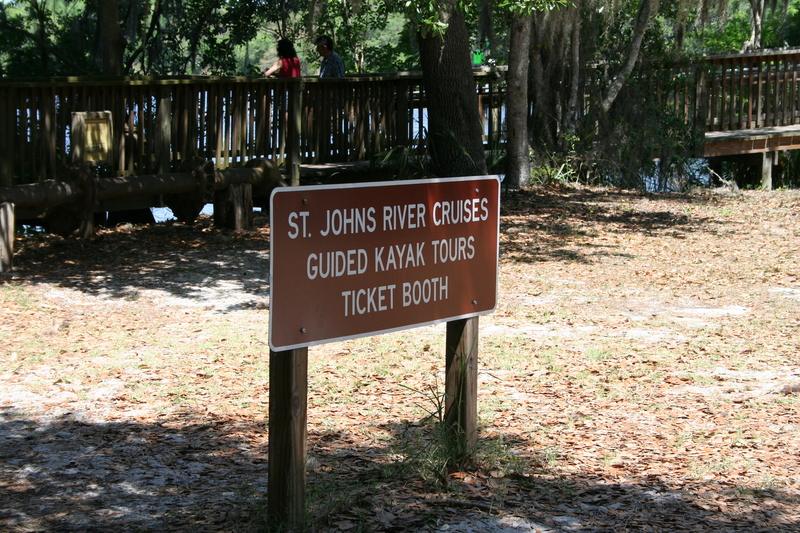 By request, St. Johns River Cruises also offers private charters, as well as, “up close and personal” kayak tours. Inside the Native II. The front seats of the boat provide an unobstructed view of the river and its wildlife; and is the perfect vantage point for photographers. On this particular day, the captain and tour guide is a former Coast Guard Seaman and native Floridian named Jordan. Jordan has been navigating the backwaters of the St. Johns River and involved in ecotourism for over ten years. Only five minutes into the trip, we came upon this gator sunning himself on a large log. With the exception of alligators and some birds of prey, the vast majority of wildlife on the St. Johns River live along the backwaters. 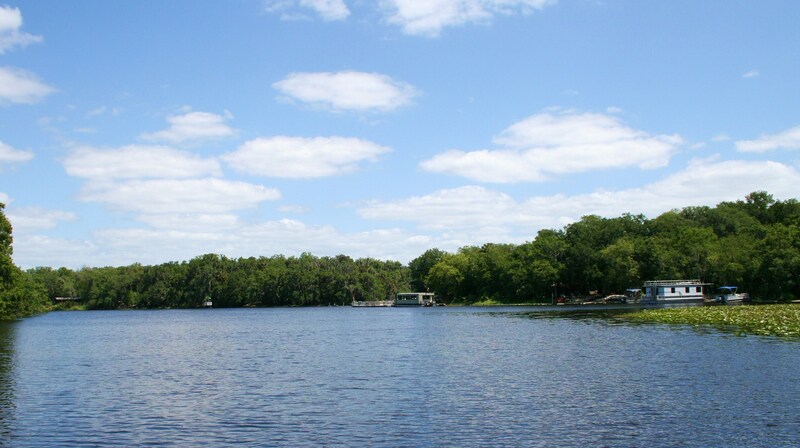 The St. Johns River is the longest river in Florida, and one of a small number of rivers in the United States that flow south to north. 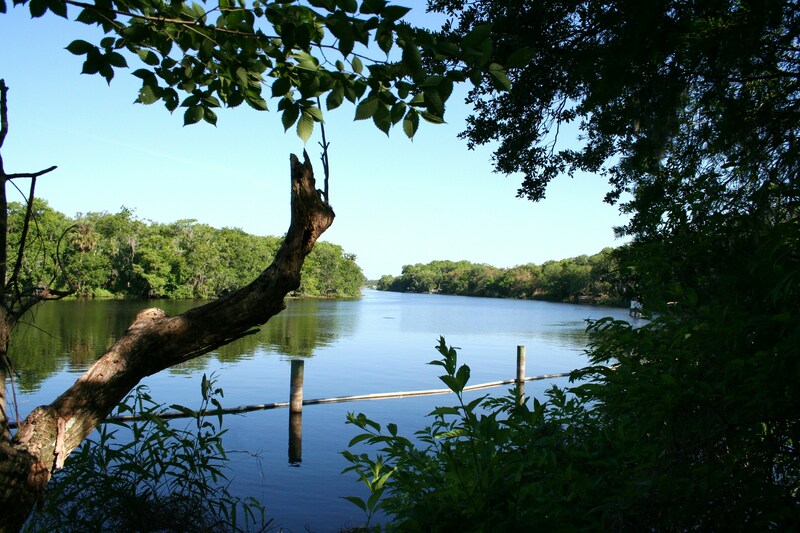 The Timucuan Indians gave the river its original name, Welaka, which means river of lakes. 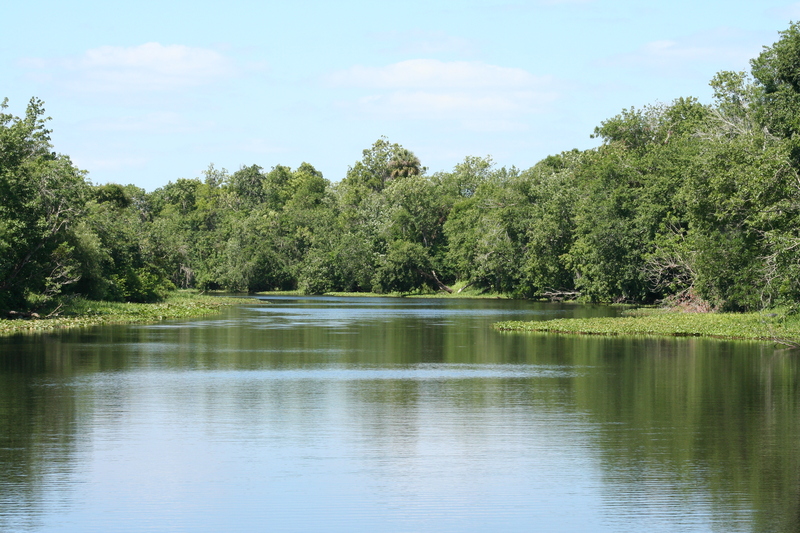 The river begins in Indian River County, near Vero Beach; its winding 310 mile path spans twelve counties, before reaching the Atlantic Ocean, near Jacksonville. 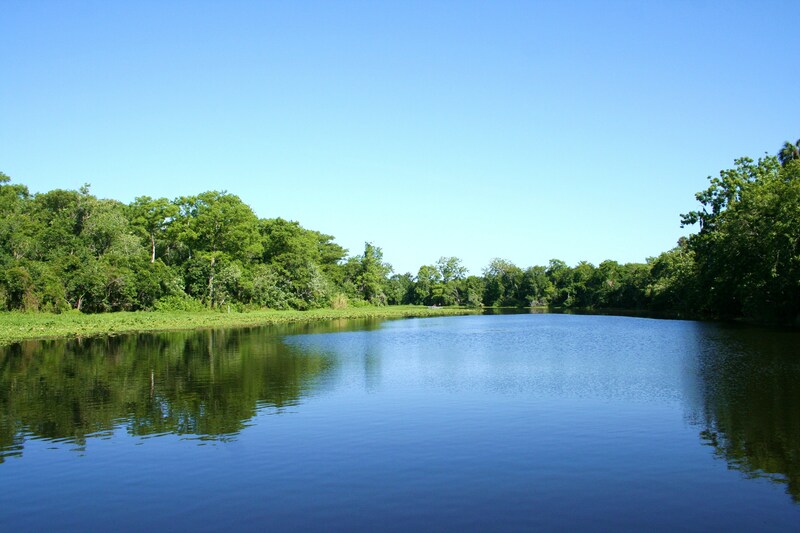 The St. Johns River runs south to north because the elevation at its headwaters is only 30 feet higher than at its mouth. This is also why the river flows so slowly and is sometimes referred to as the, “lazy river”. 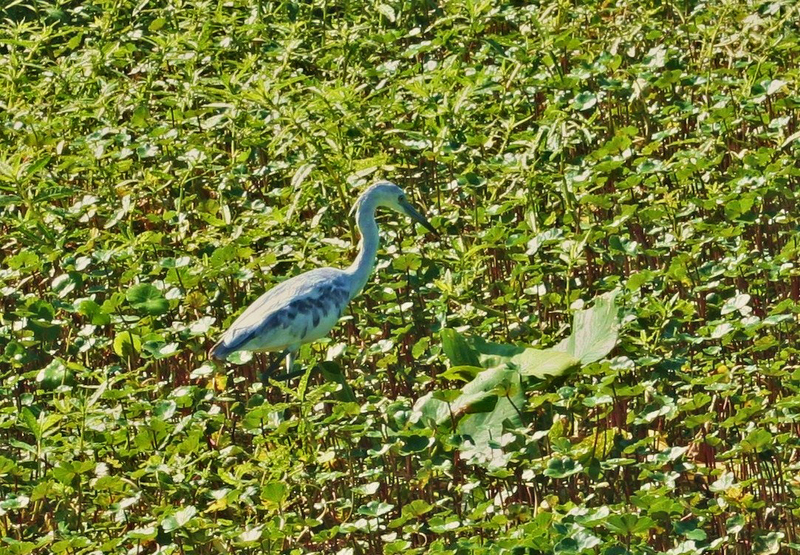 A young (fledgling) Little Blue Heron foraging in the Water Pennywort. 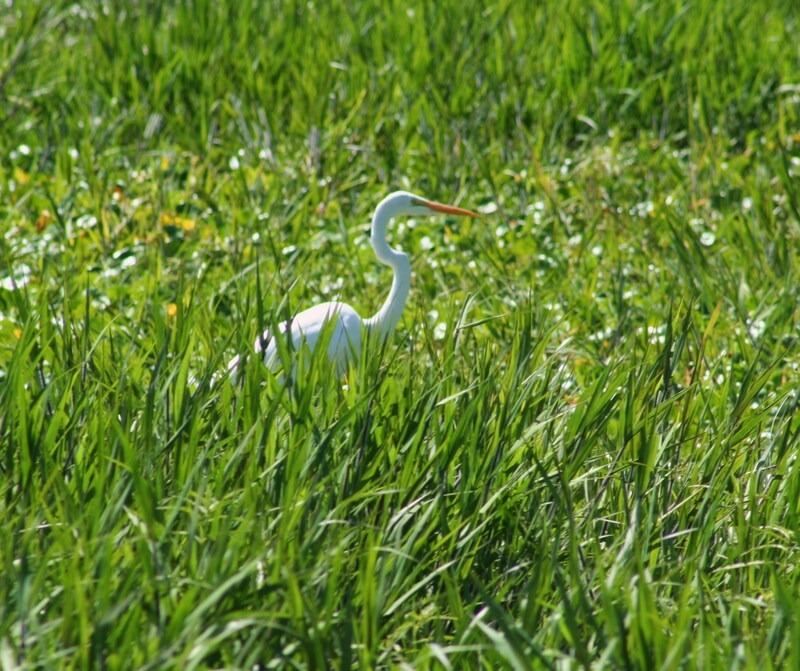 It takes approximately one year for a young Little Blue Heron to grow its blue plumage. They start out white, then go through what’s known as a “calico phase”, as the blue color begins to reveal itself and the white feathers molt. The Little Blue Herons eat grasshoppers, frogs and other crustacean. Little Blue Herons are often confused with the Tri-Colored Heron, also blue in color. 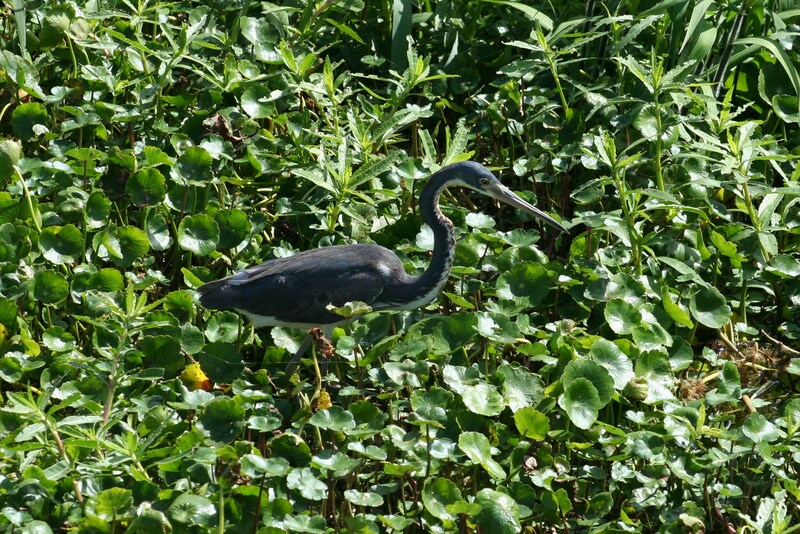 The Tri-Colored Heron differs from the Little Blue Heron in that it is a little larger, has a white belly, and white head plume. The Little Blue Heron in flight. 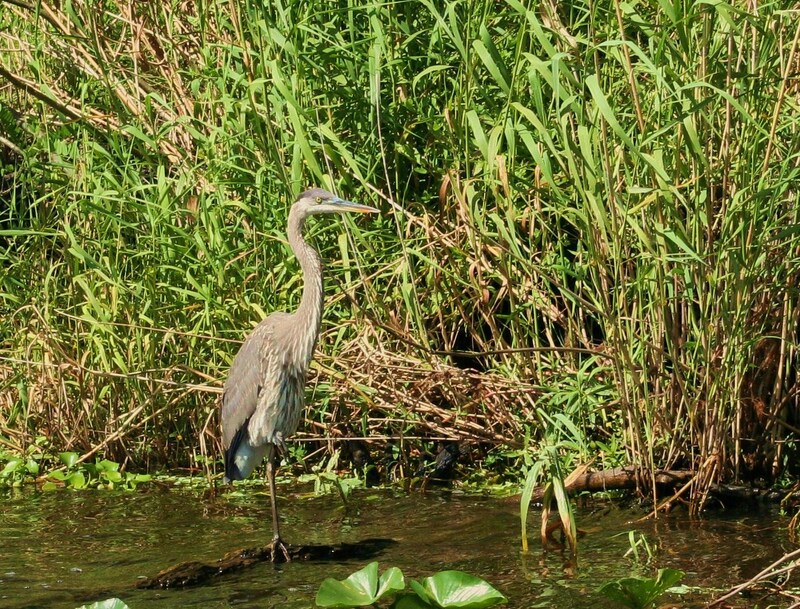 At first glance, this appears to be a one legged Great Blue Heron. Not to worry, he’s perfectly fine. Like the Flamingo, Stork and other long-legged birds, the Great Blue Heron stands on one leg when resting, preening or sleeping. 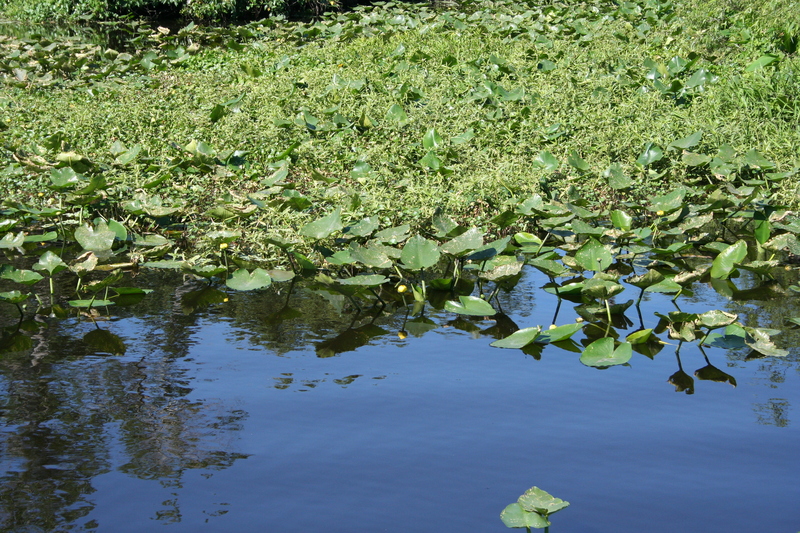 An aquatic plant known as Spatterdock, (aka Cow Lily) is abundant along the backwaters of the St. Johns River, and is an extremely important part of the river’s ecosystem. The Spatterdock provides shade and protection for fish, and is also a food source for beaver, deer and ducks. The small yellow nodules on the Spatterdock bloom during summer, and is why this plant is also referred to as the Yellow Pond Lily. 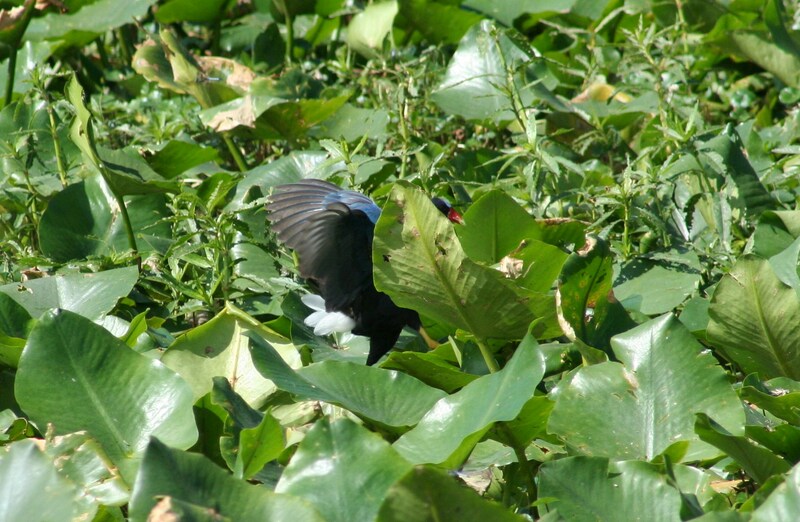 A Purple Gallinule comes in for a landing on a patch of Spatterdock. Purple Gallinules eat leaves, seeds and small insects. Spatterdock and Pennywort are their favorite feeding areas. A Tri-Colored Heron. Distinguishable from the Little Blue Heron by the white stripe on his neck and white belly. Incredibly large and extremely close. 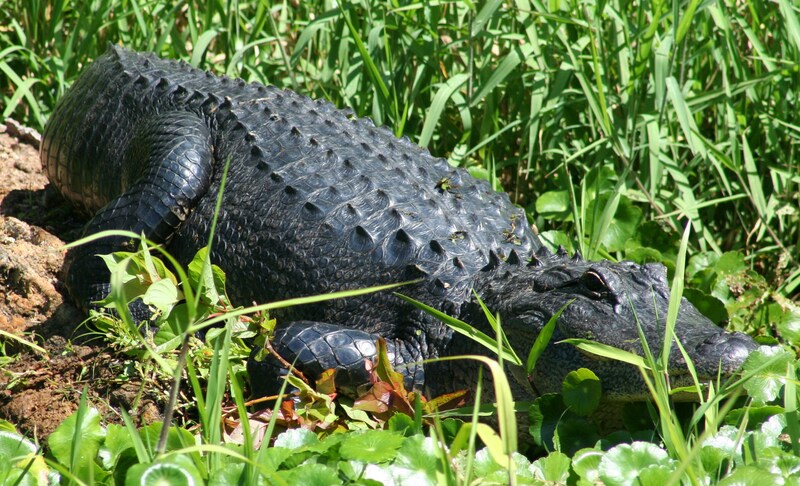 Approximately one million American Alligators live in Florida. They are no longer an endangered species; but because of their similar appearance to the endangered Florida Crocodile, they are considered a threatened species. The scales or scutes on an alligator function much like a solar panel in absorbing heat from the sun. The alligator can use the stored heat later to stay warm. The warmth of the sun also gives the alligator more energy and speed. 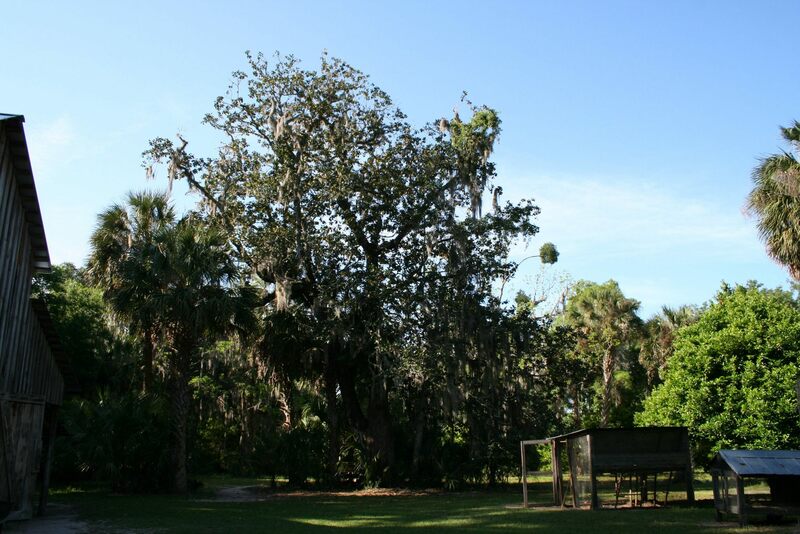 The fluted base of the Bald Cypress Tree makes it one of the most unique trees in Florida. 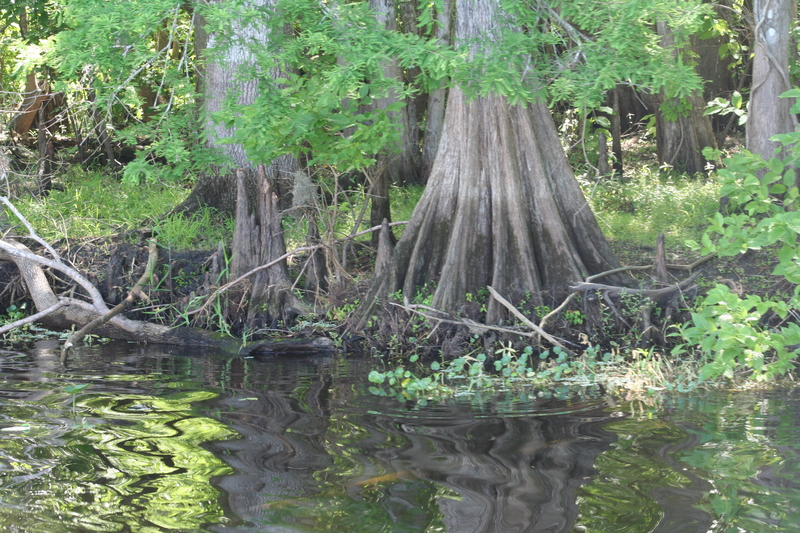 The shorter cypress knees protruding around the tree are attached to the tree’s roots, provide oxygen and assist in anchoring the Bald Cypress to the muddy soil below. As we approach yet another bend (or oxbow) in the river, across the stillness, the songs of Sandhill Cranes, Red-Shouldered Hawks, and Purple Gallinule can clearly be heard in the distance. 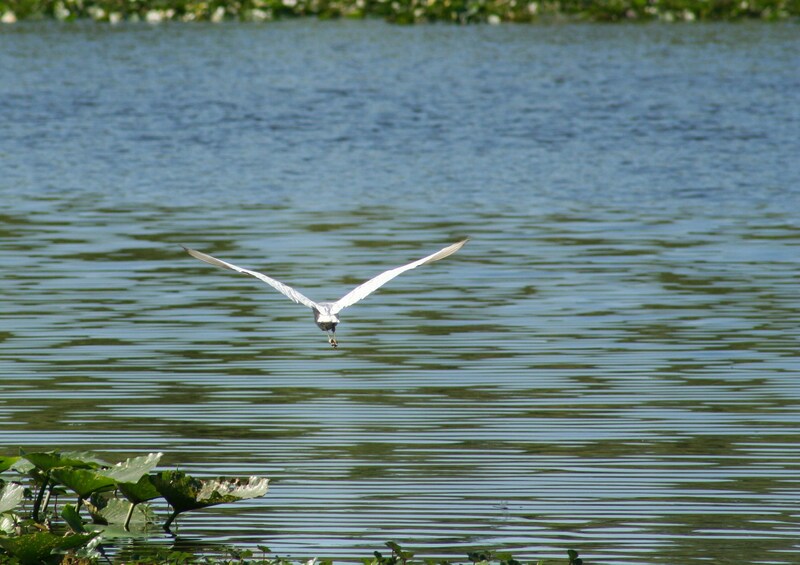 The Great White Egret is easy to spot against the green and wooded backdrop of the St. Johns River. During the late 1800’s and early 1900’s, large numbers of Great White and Snowy Egrets were killed so their feathers could adorn the top of women’s hats. Feathered hats were all the rage, and thousands of Egrets were slaughtered, for a handful of feathers. What was known as the plume trade was a lucrative business; Egret feathers were worth more than gold. Through the efforts of the Audubon Society, Harriet Hemenway and Theodore Roosevelt, the plume trade came to an end by the 1920’s, due to the passage of such laws as the New York State Plumage Law, and the Federal Migratory Bird Treaty Act. It seems appropriate a sketch of the Great Egret serves as the National Audubon Society’s logo, since this bird would have been slaughtered to the point of extinction, had it not been for the advocacy of the Audubon Society, the American Orinthologists Union and many others; who as a collective, saved America’s birds. 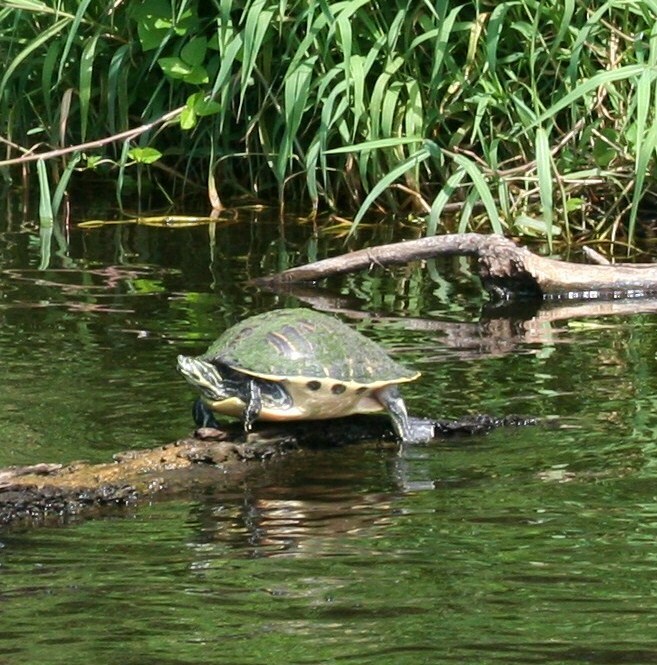 The Yellow-bellied slider is a common freshwater turtle. 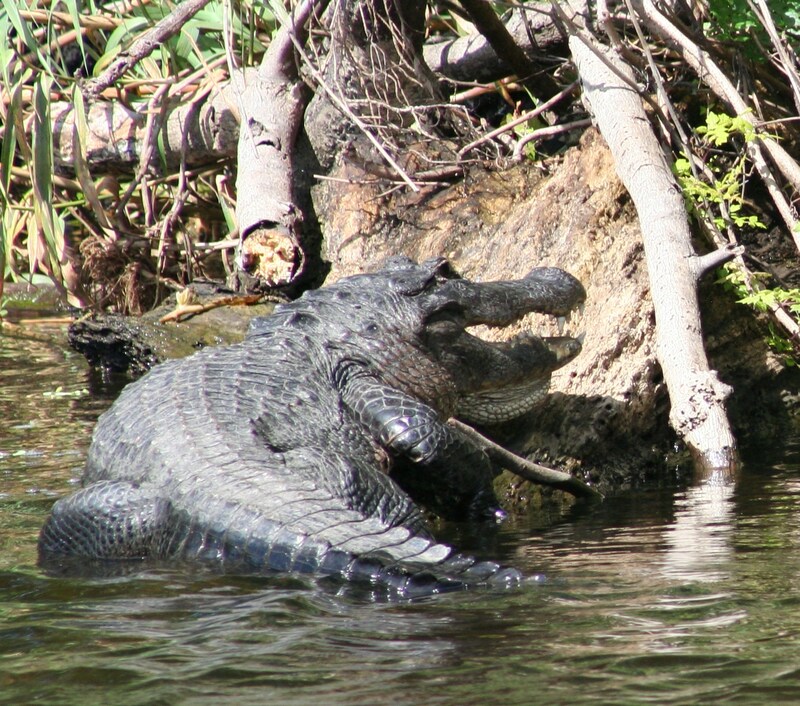 They prefer to feed in the morning, and like the alligator, enjoy basking on logs. 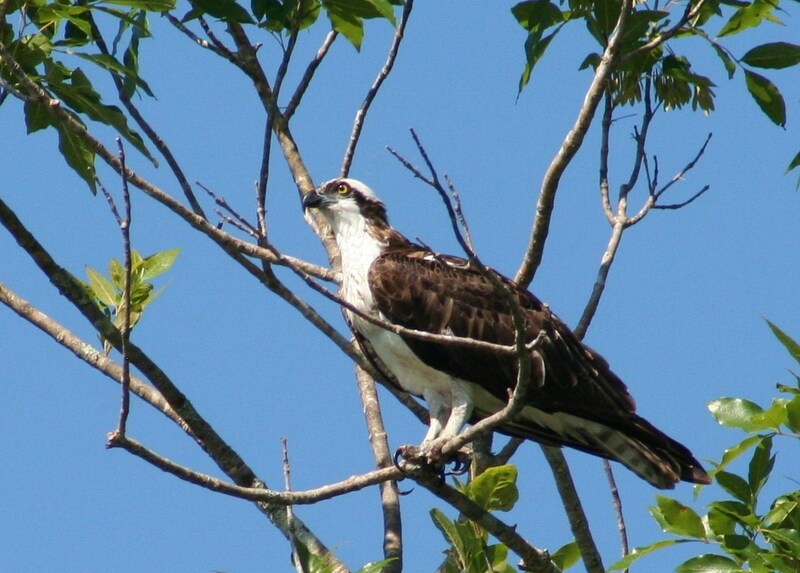 Florida Ospreys always make their home near water, because they primarily feed on fish. For this reason, they are also known as the fishhawk or fish eagle. Their nests are large and usually located at the top of trees. Due to human encroachment within its habitat; however, the Osprey has been known to built nests on top of power poles and cell phone towers. The Osprey is one BIG bird, with a wingspan of between 50 and 70 inches. 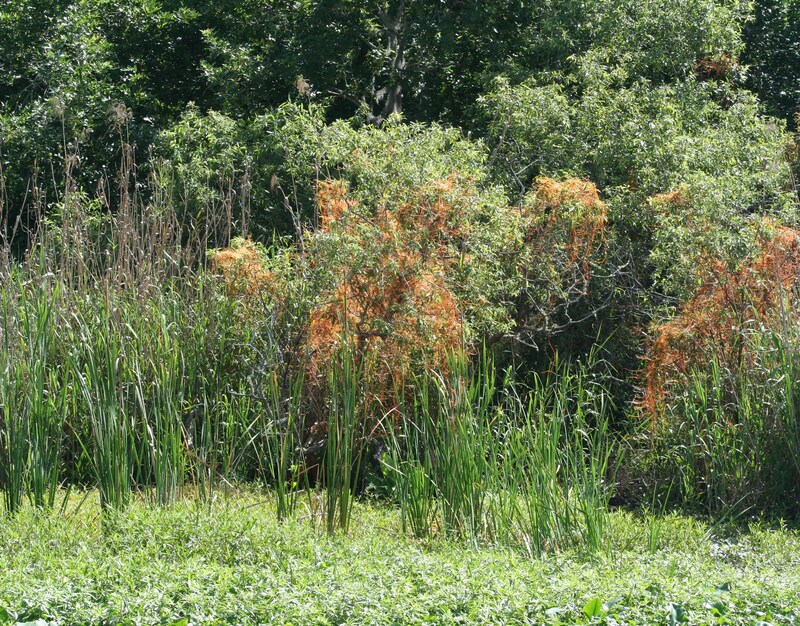 This unusual splash of color across the top of this small scrub oak, is actually a parasitic plant known as Dodder Vine. The Dodder Vine has several nicknames, including hellweed and witches’ shoelaces. The Dodder Vine uses tiny suckers, or haustoria, to attach itself to host plants. Dodder Vine has no leaves and loses its roots, once it finds and attaches itself to the host. Fortunately, the Dodder Vine almost never destroys the host plant/tree; but can leave it looking bedraggled and stunted. 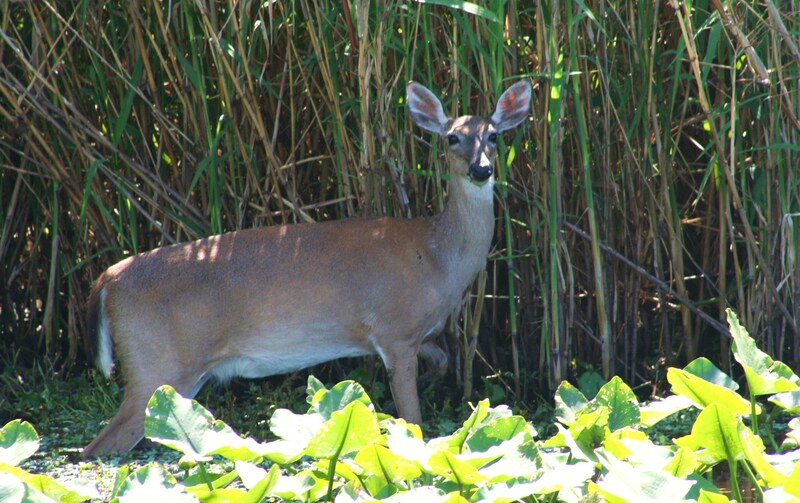 As the boat glided quietly past these reeds, this Florida White-tailed doe seemingly appeared out of nowhere. She gave us an unconcerned glance, then munched on some nearby Pennywort before darting back into the woods. There are four subspecies of White-tailed deer in Florida. The endangered Key Deer is found only in the Florida Keys, the Coastal White-tailed deer and Virginia White-tailed deer can be found in the Panhandle and Northeast part of Florida, respectively. And the Florida White-tailed deer, which live primarily on the peninsula of Florida. Unlike the migratory North American Sandhill Crane, the Florida Sandhill Crane are permanent residents and can be found in both rural and urban areas. The Florida Sandhill Crane is a threatened bird species due to its dwindling numbers and destruction of its habitat. Fortunately, the Florida Sandhill Crane is also a protected species. 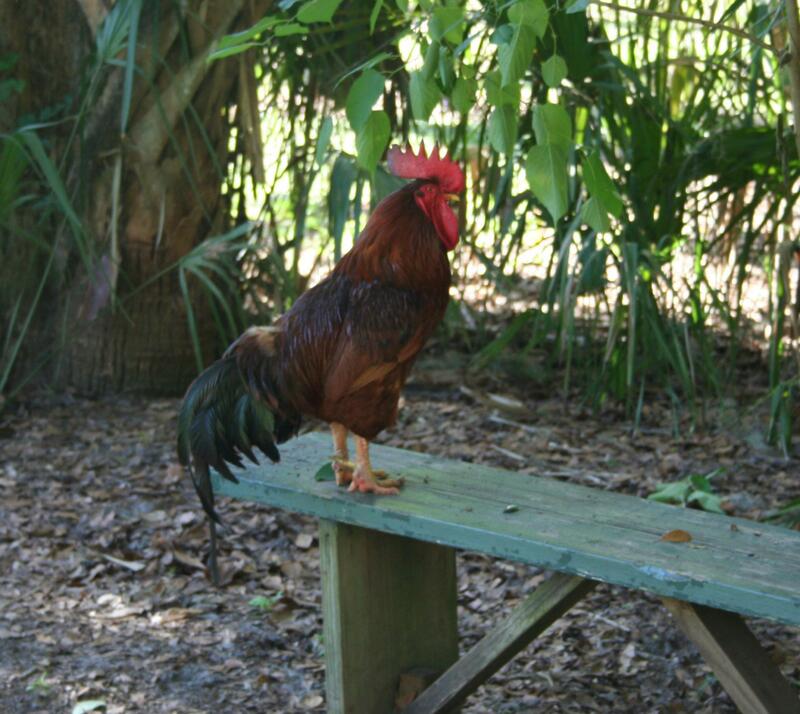 In addition to the illegality of harming or killing these birds, it is also illegal to feed them. The Florida Sandhill Crane is omnivorous; their favorite foods include insects, worms, lizards and berries. 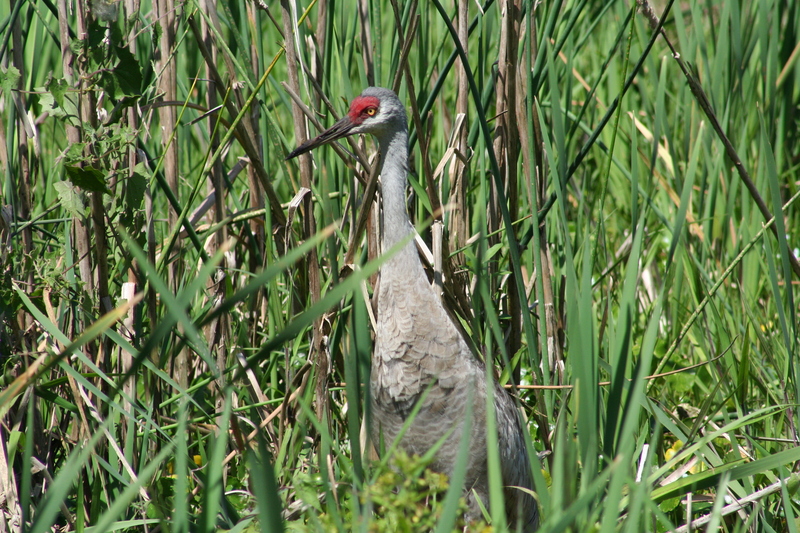 Unlike other wading birds, the Sandhill Crane does not search for food in the water. The Florida Sandhill Crane mates for life with both parents participating in building the nest, incubating the eggs and feeding/protecting their chicks. Most chicks are ready to strike out on their own after nine or ten months. 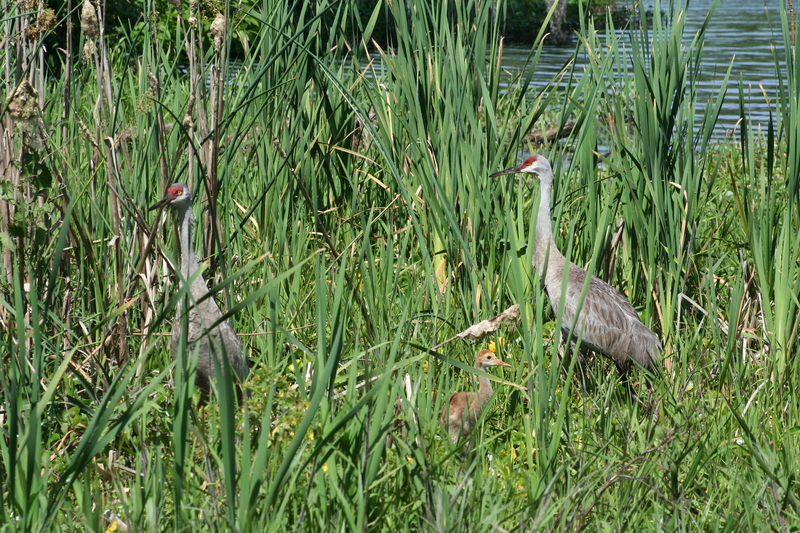 Sandhill Cranes are social creatures and can often be seen traveling in small groups. Their distinctive voice can be heard for long distances. Between mated pairs, the female makes two calls for every one call of the male. This is known as unison calling, and is a familiar sound in many residential areas and along golf course fairways. 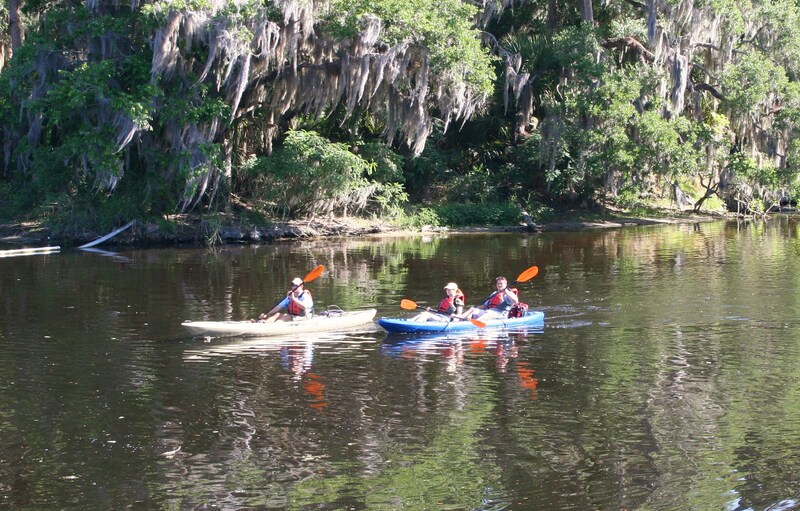 This scenic tributary of the St. Johns River is home to the Osceola Turkey and Barred Owl. Although I had my Canon at the ready, these birds managed to elude the camera. A strangely beautiful bird, the Anhinga is a permanent resident of Florida. Anhingas are able to swim and hunt underwater for short periods of time, spearing fish using their long neck and sharp beak. Because the feathers of the Anhinga have no oil glands, the Anhinga can only dry its wings by spreading them for long periods of time in the sun. 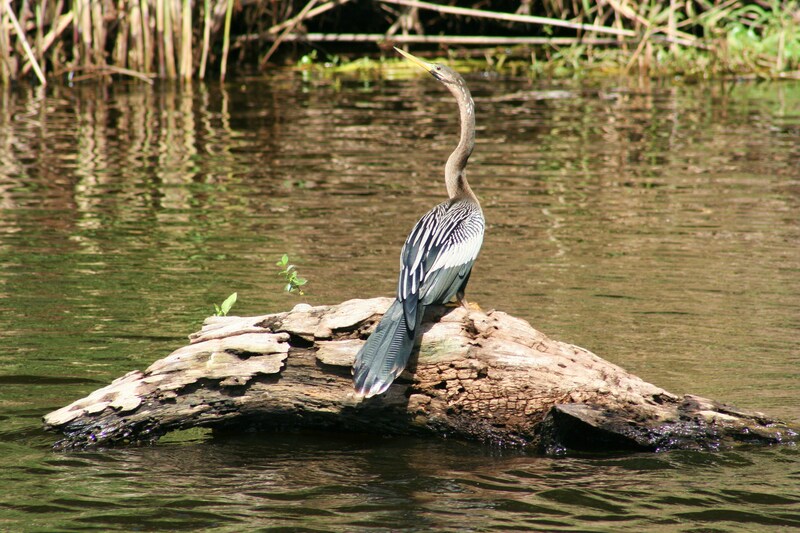 It is very difficult for the Anhinga to fly while its wings are drying. The male Anhinga is almost completely black, while the female has a tan colored head and neck. As the Native II returned to the dock, and as Jordan explained why the Manatee is an endangered species, I was impressed with his passion and deep respect for the animal inhabitants of the St. Johns River basins, Florida’s fragile ecosystems and our beloved Manatee. 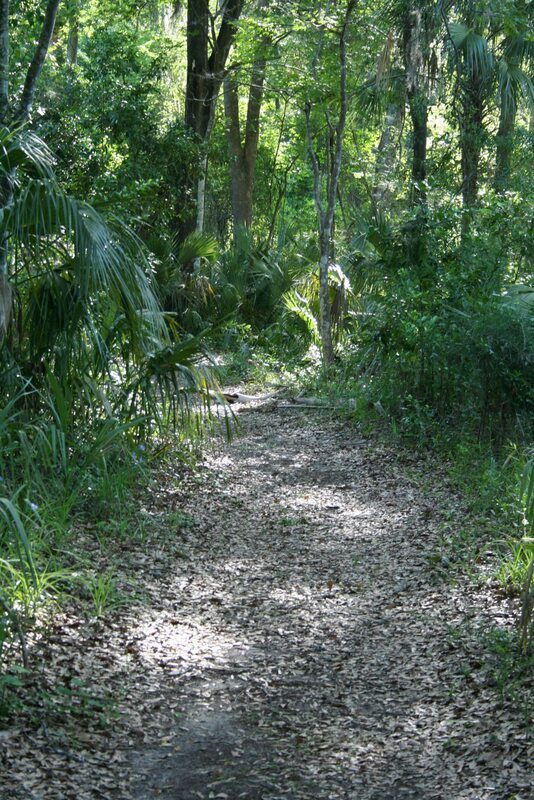 Floridians are fortunate living in a state with so much natural beauty. 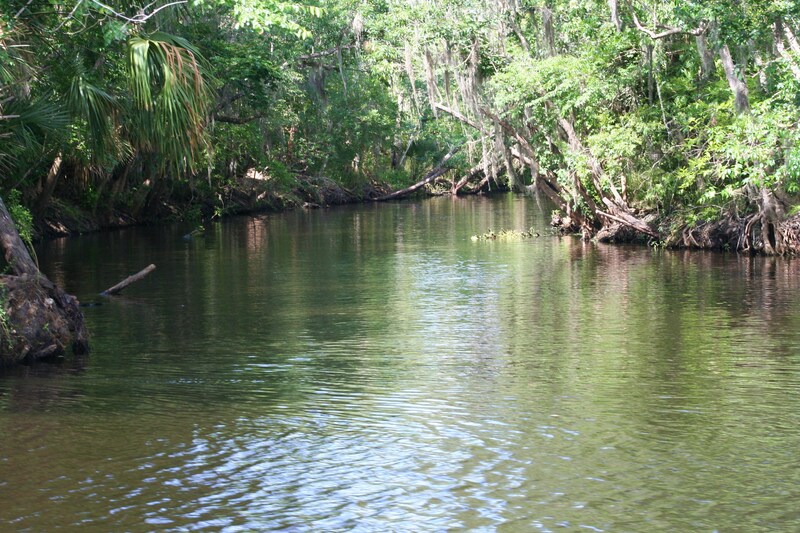 It is incumbent on all of us to do all we can to protect and preserve Florida’s natural resources. 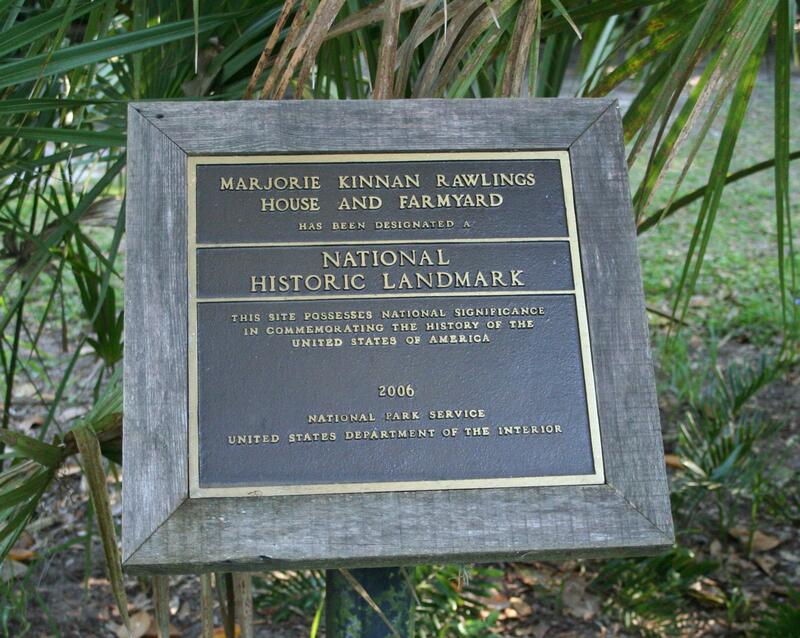 Visiting the Marjorie Kinnan Rawlings Historic State Park was a fascinating journey back to the Florida of long ago. 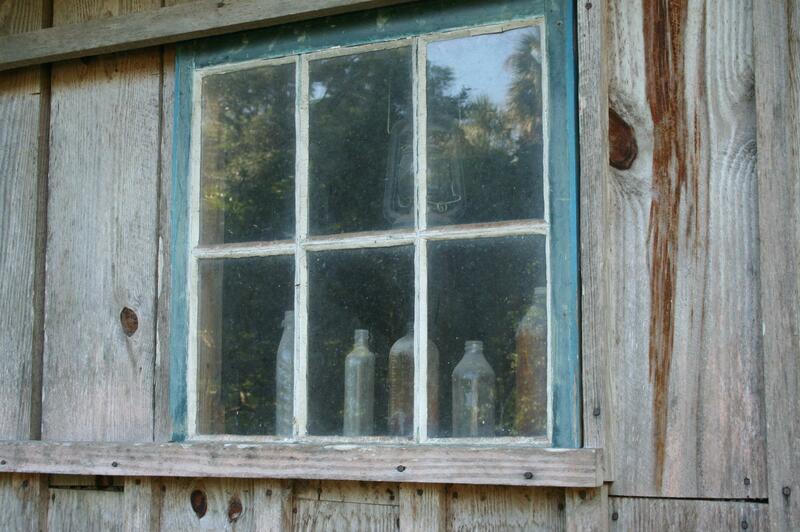 I felt creative energy all around me as I walked through the house, and adjacent grounds. And while standing on the front porch where Marjorie turned the inspiration that surrounded her, into short stories and unique classics; it seemed as though I was in another time; if only for an hour. 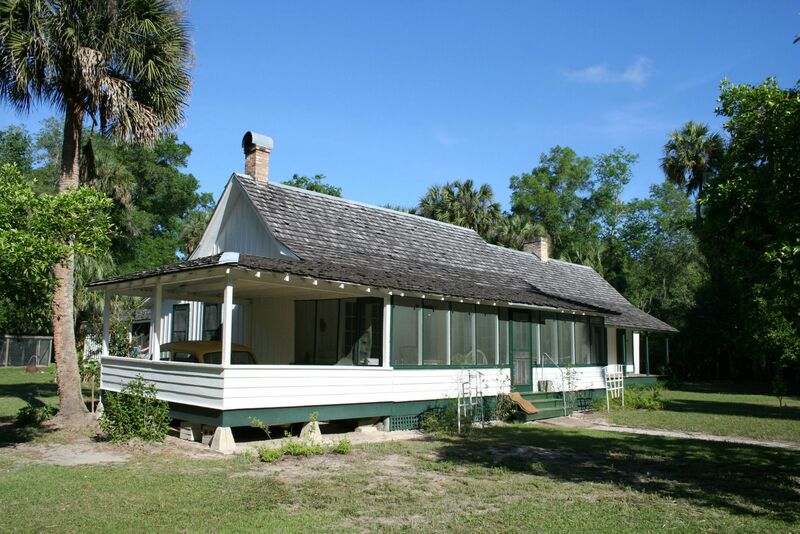 If you’re a fan of Rawlings’ books, a nature lover, or a Florida history buff, you’ll want to add Marjorie Kinnan Rawlings Historic State Park to your short list of places to visit. 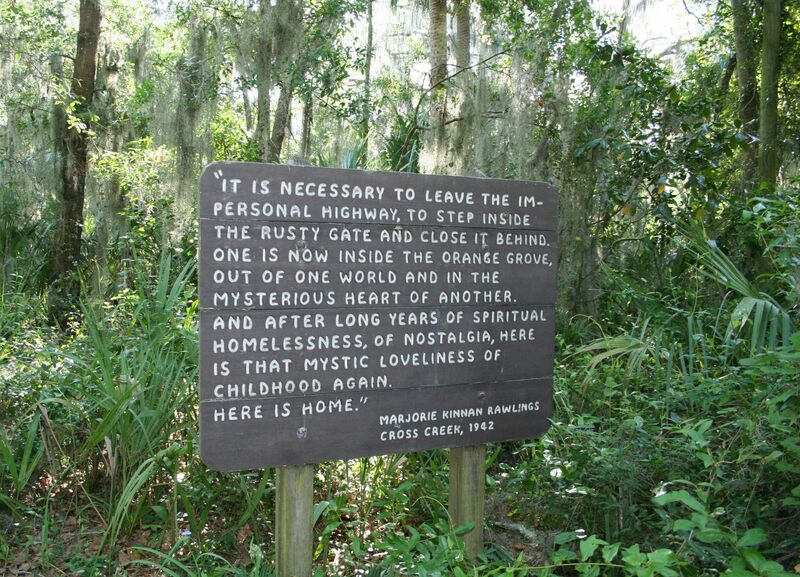 Marjorie Kinnan Rawlings lived in Cross Creek, Florida from 1928 until just before her death in December 1953. 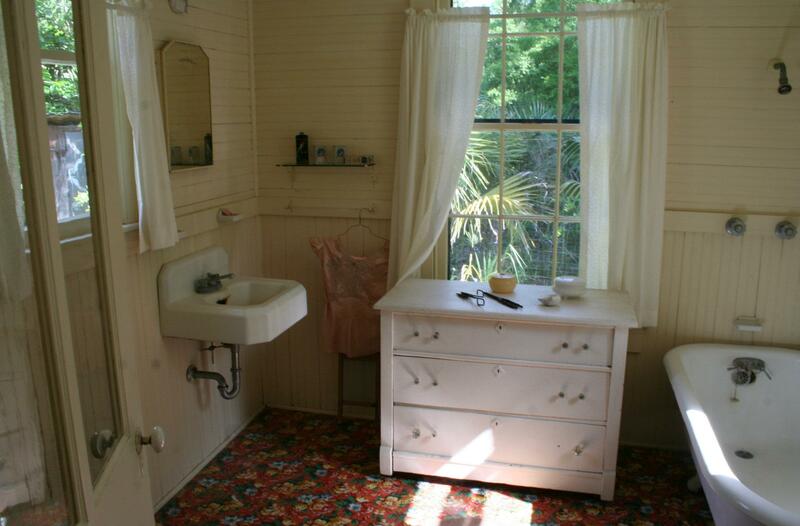 The cypress-shingled, “cracker” house Marjorie Kinnan Rawlings called home from 1928 – 1953. When she and first husband, Charles Rawlings purchased the home and adjacent 72 acres, they named it, “Los Hermanos”. (the brothers) Over the years, and as she was able to afford to do so, Marjorie made many improvements to the house and surrounding property. Looking north, the path leading from the parking area to the farmyard. Volunteers with the Friends of the M.K. Rawlings Farm, Inc. maintain the house, barn and adjacent farmyard. 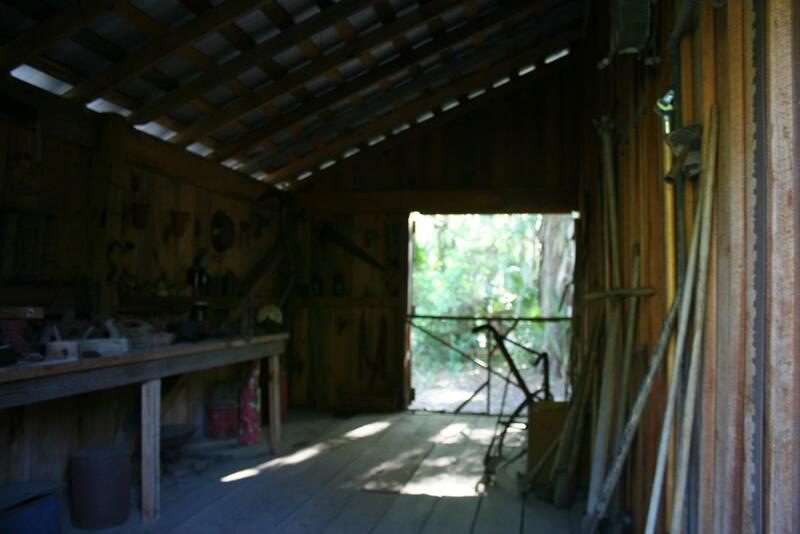 A peek inside the tool shed, attached to the barn. The original barn was demolished in 1969. The current barn and tool shed were constructed in 1991. 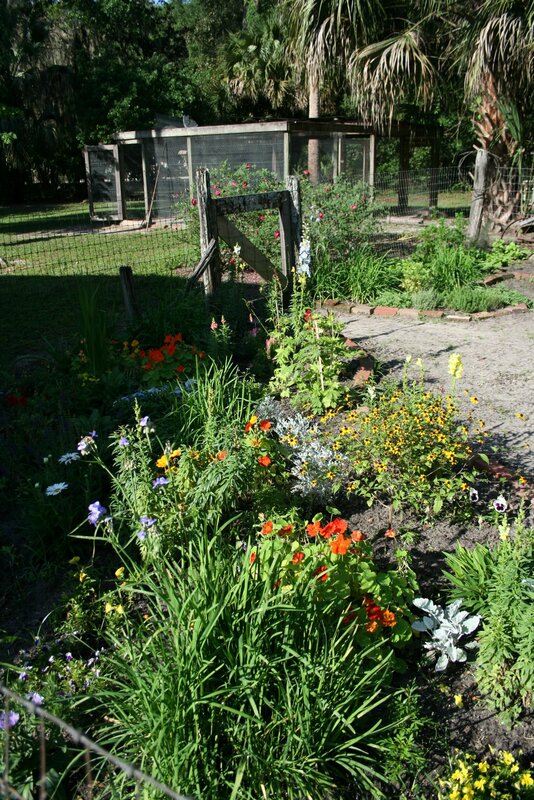 Just a few of the perennials in the backyard garden. A duck pen can be seen in the background. 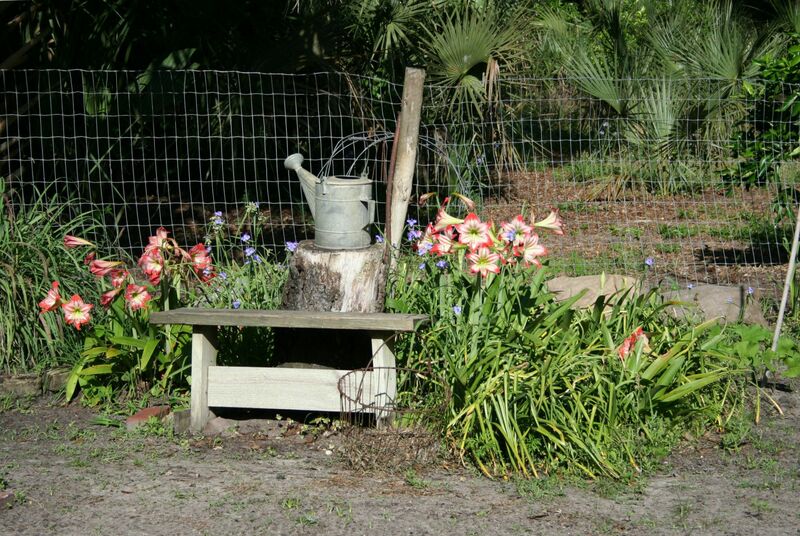 An old watering can sits amid clusters of Daylilies. 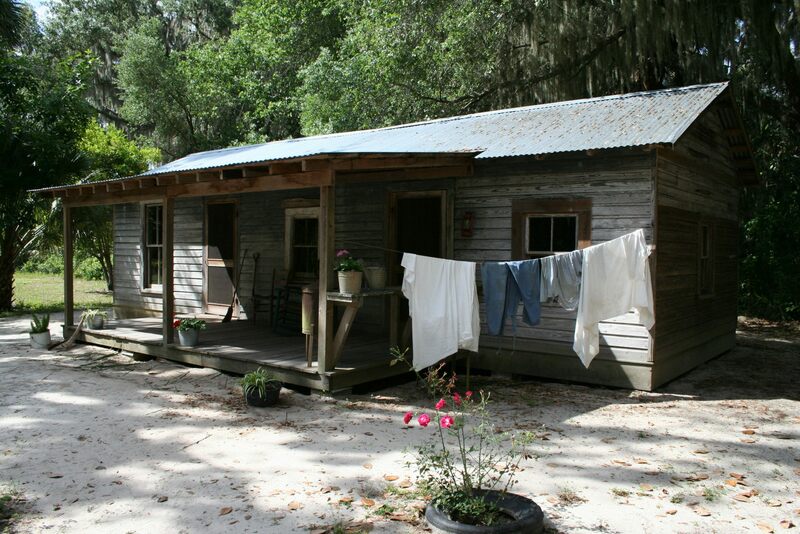 Most “cracker” homes were small and usually only contained two or three rooms. After additions to the house were completed in the 1940’s, Marjorie’s home grew to 3,000 square feet, and nine rooms. A mansion compared to the other homes in Cross Creek. The house is actually three separate, yet connected units. The main house, the kitchen-dining room, and the guest house. This magnificent Magnolia tree was planted almost seven decades ago, and still stands today. 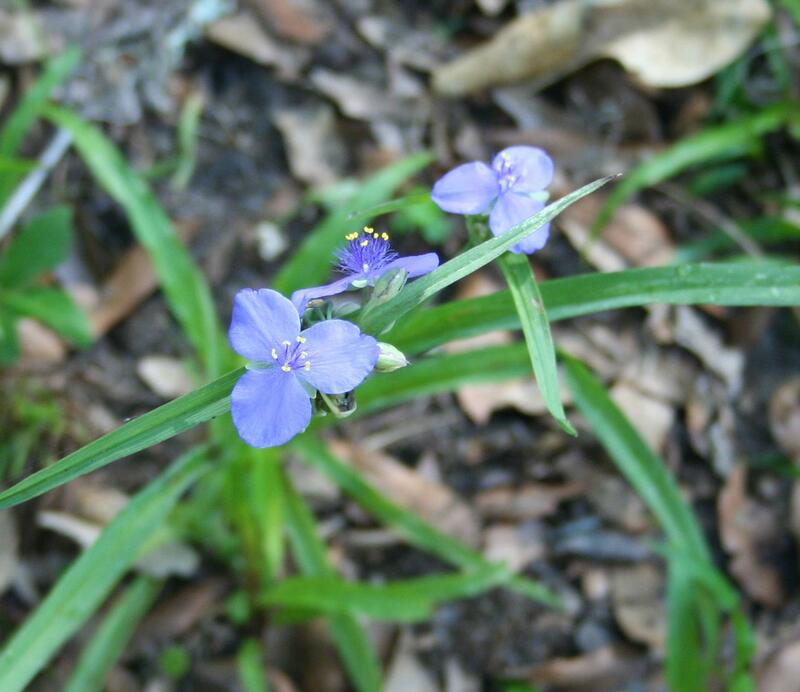 Spiderwort plants are abundant throughout the garden and yard. But you must come early if you want to see them. The Spiderwort flower only blooms briefly during the morning. 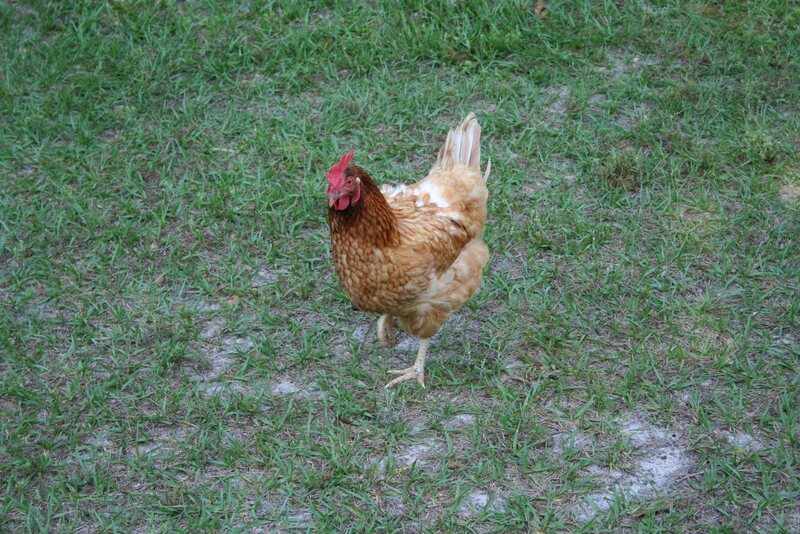 One of many free range chickens that roam the farmyard. The East Grove Trail begins directly across the street from the house. 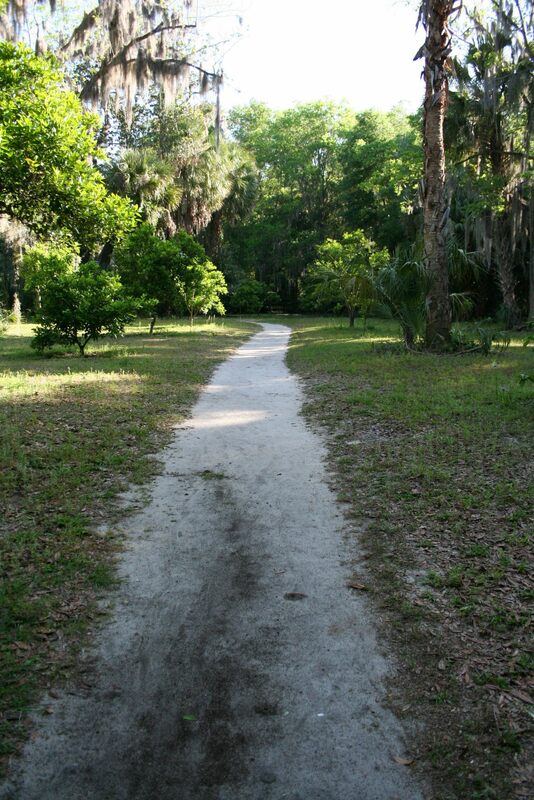 The trail is located in the middle of what was once a huge thriving orange grove. Remnants of the 3,000 tree orange grove, along the East Grove Trail. A brooding hen. 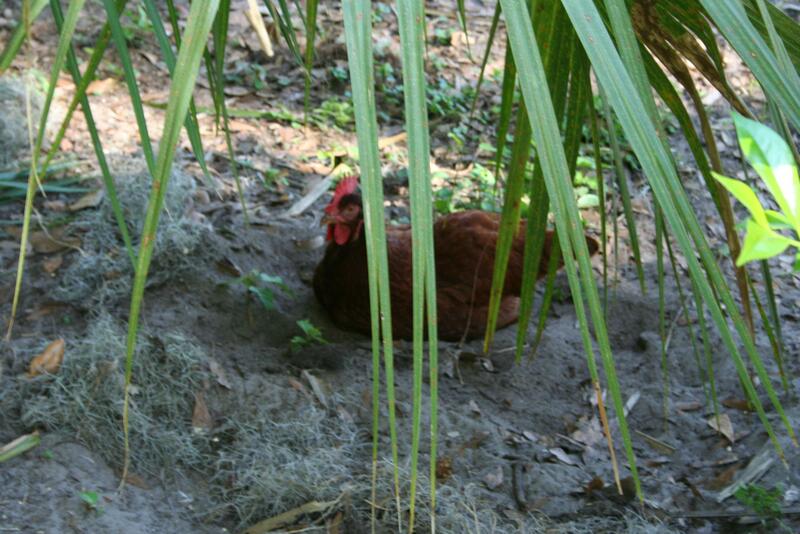 Apparently, the hens in the farmyard lay their eggs wherever they feel safe. 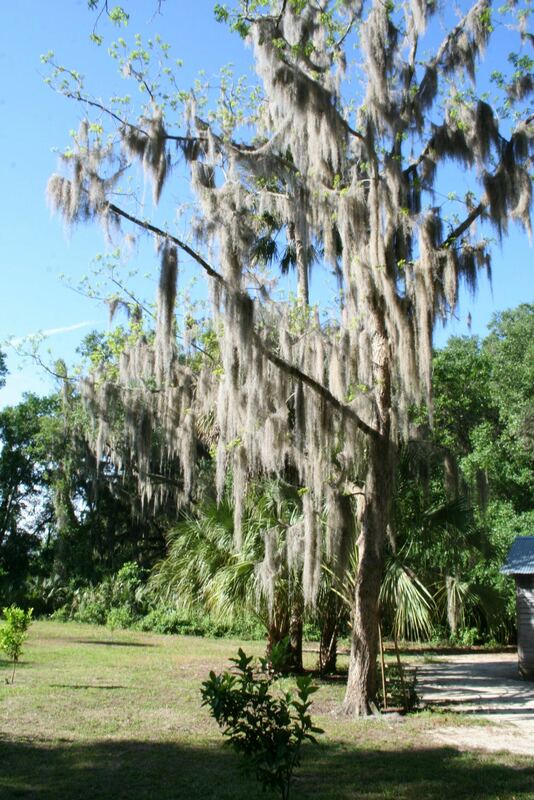 In this case, under a Saw Palmetto Palm, in the sugar sand, surrounded by Spanish Moss. The south side of the front porch. 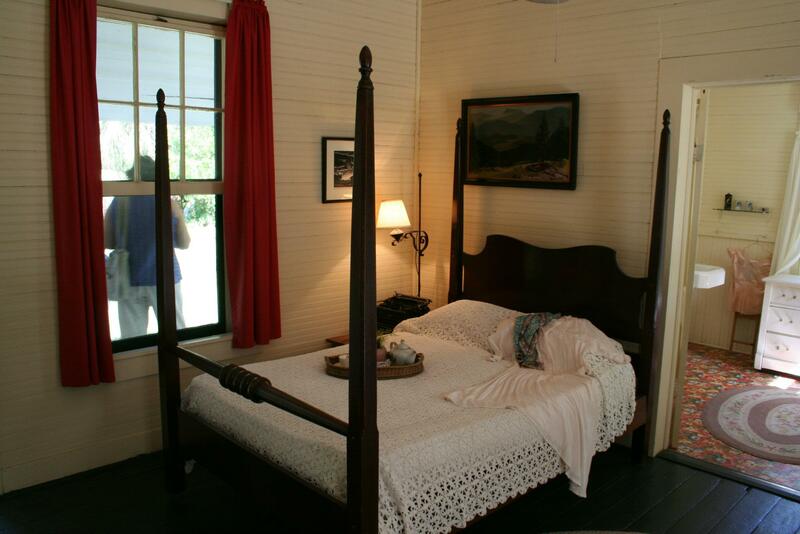 Marjorie often used the single bed to take naps during the day. Because the porch was the coolest room in the house, it was not uncommon for her to sleep on the porch during the hot summer nights as well. 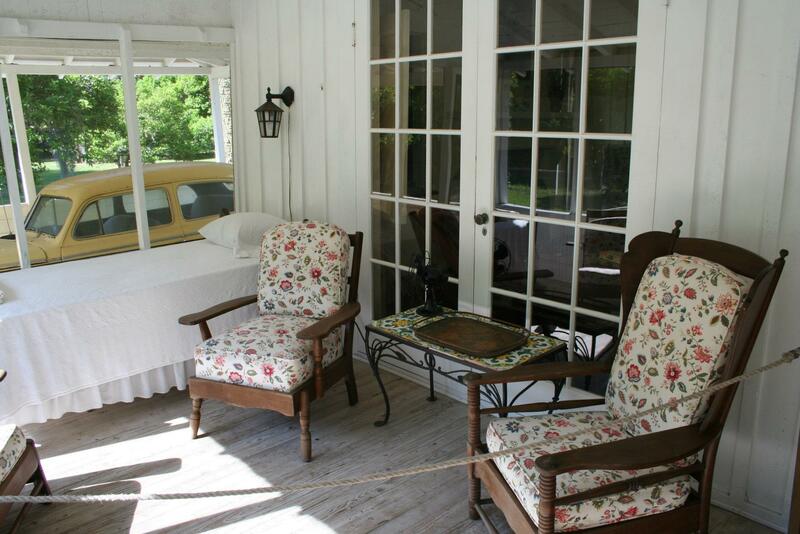 The car in the carport is a non-running replica of the car once owned by Marjorie Rawlings. The north side of the front porch. 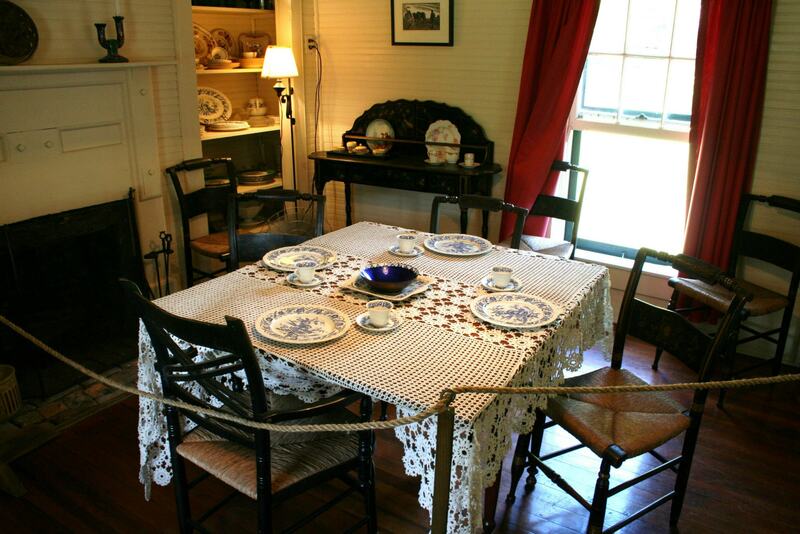 Marjorie’s first husband, Charles Rawlings, built this table so he could invite neighbors over for a friendly game of poker. Unfortunately, most of his neighbors folded before ever playing a hand, because they couldn’t afford the ante. In 1933, Charles folded on the marriage and Florida, divorcing Marjorie and moving back to Rochester, New York. 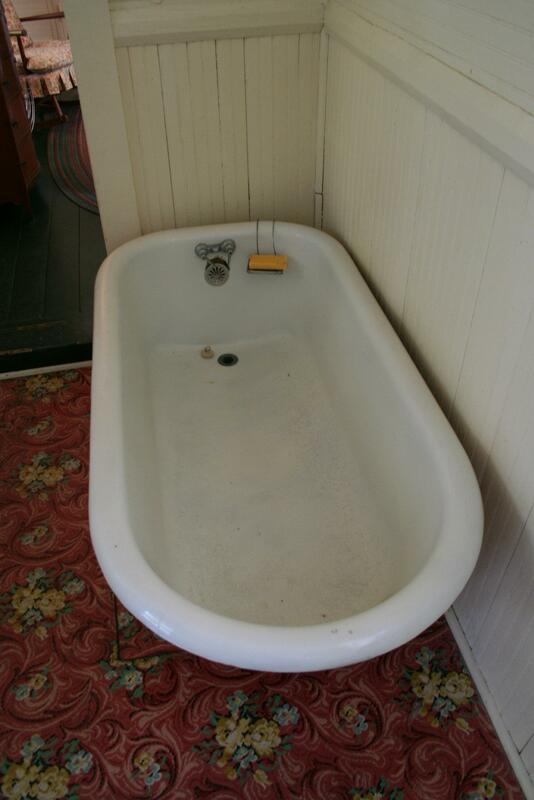 Electricity wasn’t installed in the home until the 1930’s. 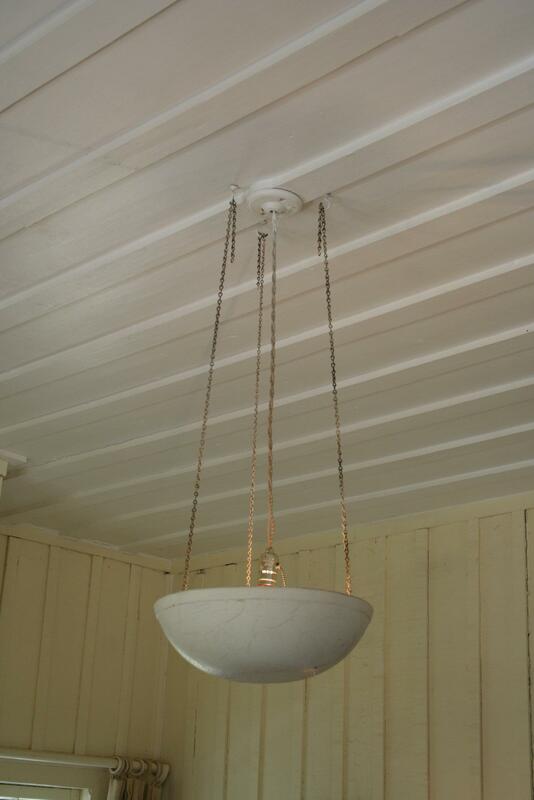 Because Marjorie did not like the glare produced by bare bulbs, she improvised light fixtures using white butter bowls. The parlor. A liquor cabinet and bar are cleverly concealed in the corner closet. Marjorie was partial to Kentucky bourbon and moonshine. Appropriately, books fill a corner bookshelf. 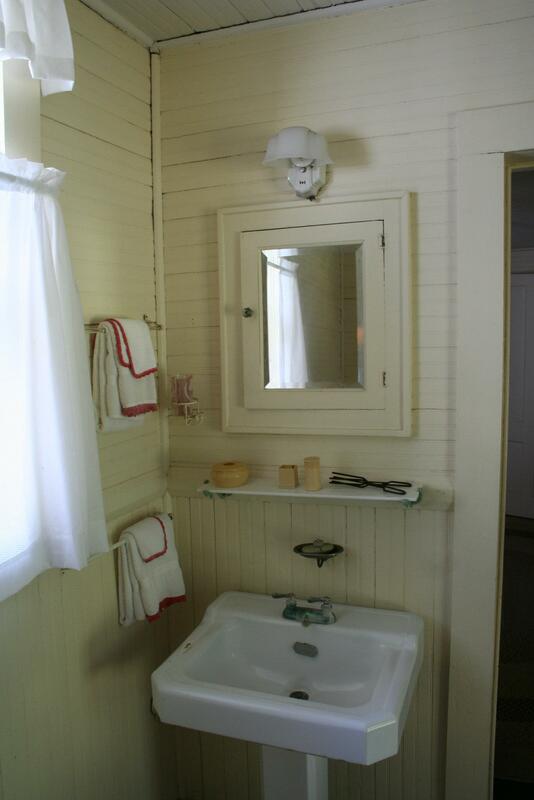 The guest bathroom was added in 1930, when Marjorie had indoor plumbing installed throughout the house. She was so excited, she threw a party, filling the tub with ice and soft drinks. The guest bathroom vanity leaves little room for vanity. Gregory Peck slept here; though it couldn’t have been easy. This bed is short on length. Gregory Peck stayed with Marjorie in 1946 during filming of the movie, The Yearling. Although most of the movie was filmed in California, some scenes were shot in nearby Silver Springs. The master bathroom includes a tub shower combo. 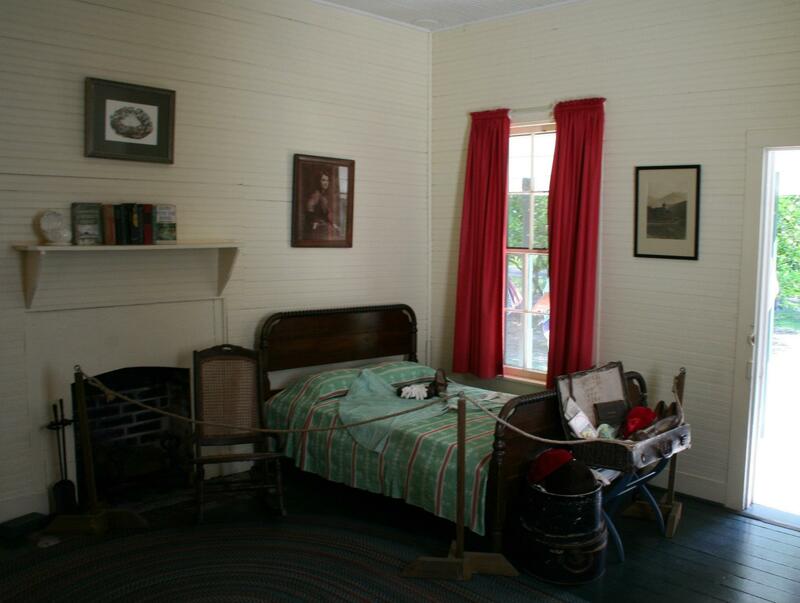 Marjorie’s bedroom. 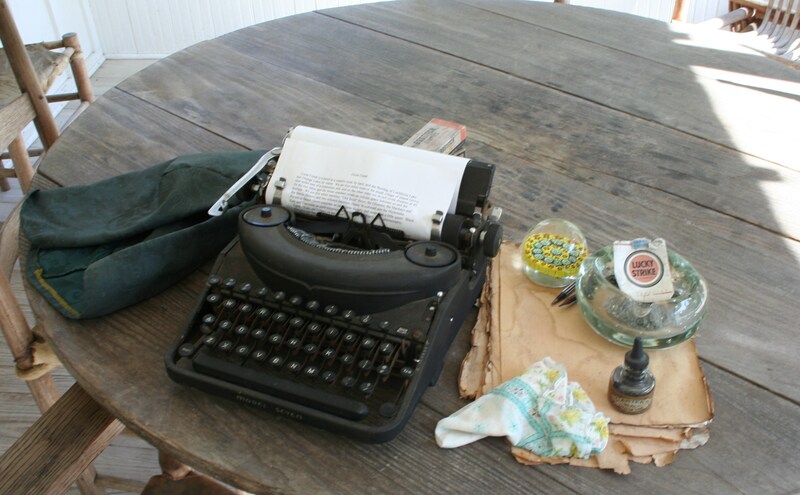 She kept a second typewriter next to her bed which she used often, and whenever served breakfast in bed. Vintage flat iron, ironing sprinkler bottle and wooden ironing board. This is the back end of the breezeway that runs front to back through the center of house. 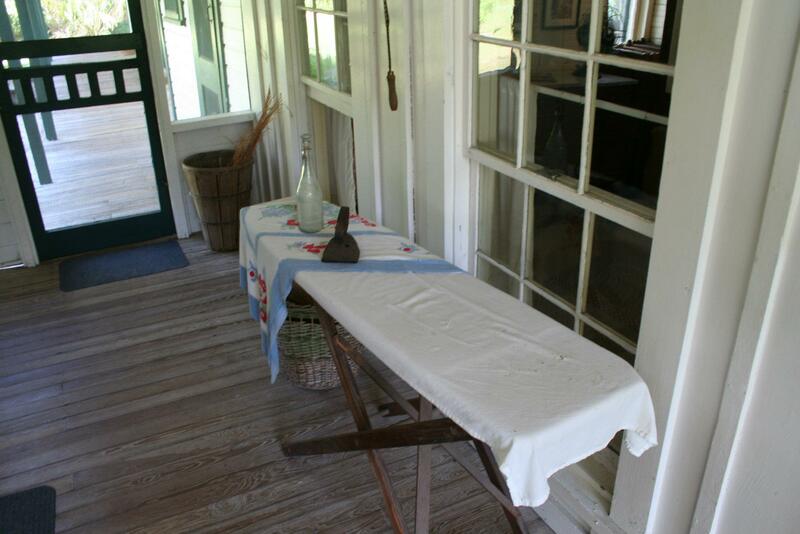 Breezeways were common in southern homes built during the late 19th century and before air conditioning, and are often referred to as either dogtrot or breezeway houses. Windows and doors along the breezeway and adjacent rooms helped pull cooler outside air into the bedrooms and other living areas of the home. 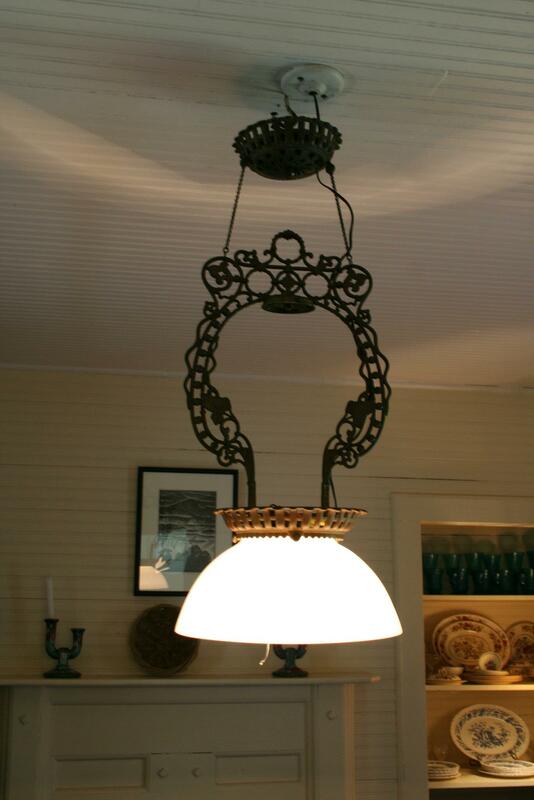 The dining room boasts a more ornate butter bowl light fixture. The dining room table is not the original used by Marjorie; but the Hitchcock chairs and Wedgewood china are. 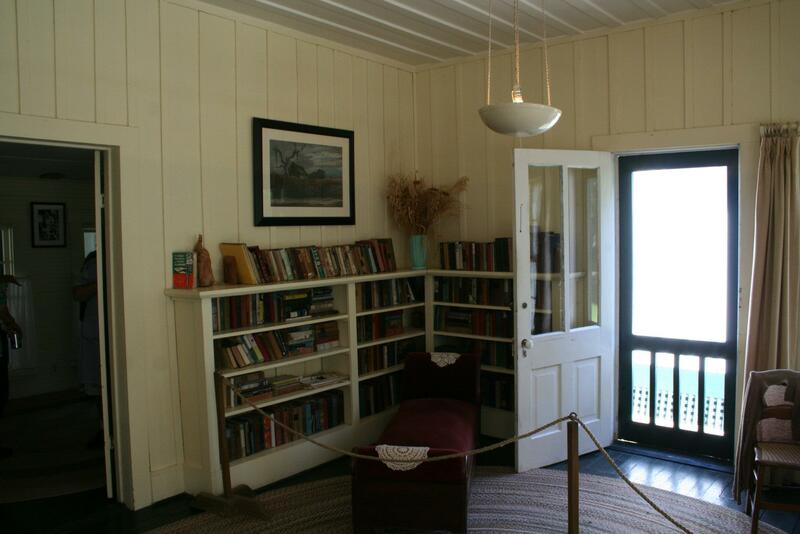 In this room, Marjorie entertained, among others, Margaret Mitchell and Robert Frost. 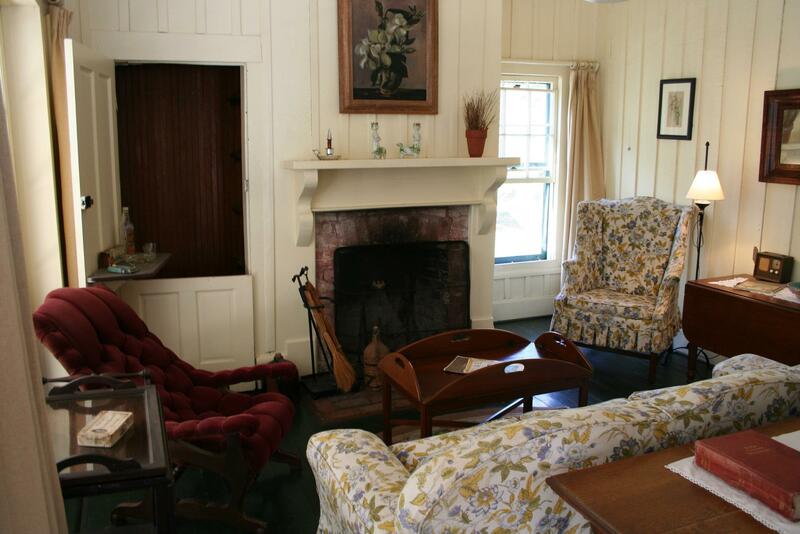 Robert Frost visited Marjorie often and the two would talk for hours by the fireplace. 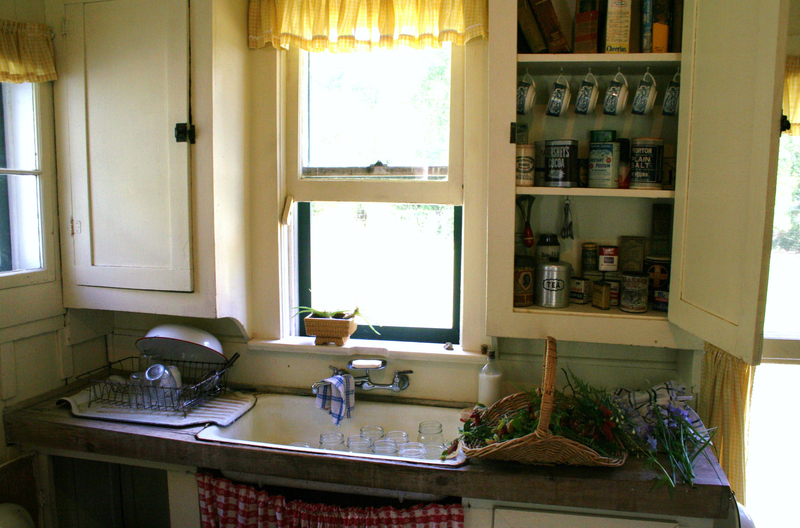 Marjorie would always seat herself facing the window, so her guests would not have to look at the outhouse during dinner. 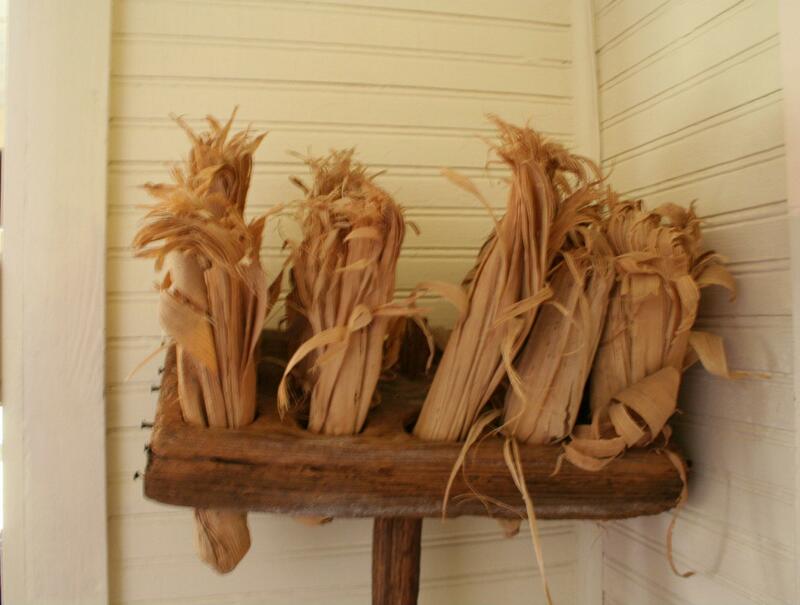 A corn husk broom greets visitors walking from the dining room into the kitchen. Marjorie Rawlings once wrote, “My one vanity is cooking”. In her book, Cross Creek, she devoted a chapter to writing about unusual meals prepared by her Cross Creek neighbors. Because people from all over the world wrote asking for the recipes, Marjorie’s publisher suggested a sequel to Cross Creek. The result was the Cross Creek Cookery, published in 1942. 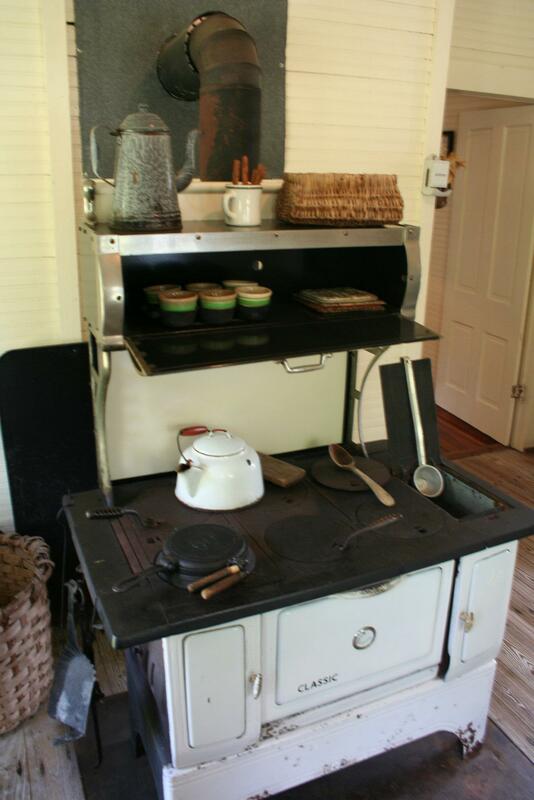 The original wood burning stove. When it came to cooking, Marjorie wrote, “Food imaginatively and lovingly prepared, and eaten in good company, warms the being with something more than mere intake of calories.” Marjorie grew the herbs and vegetables used in preparing her famous meals. One of the few remaining Pecan trees on the property. 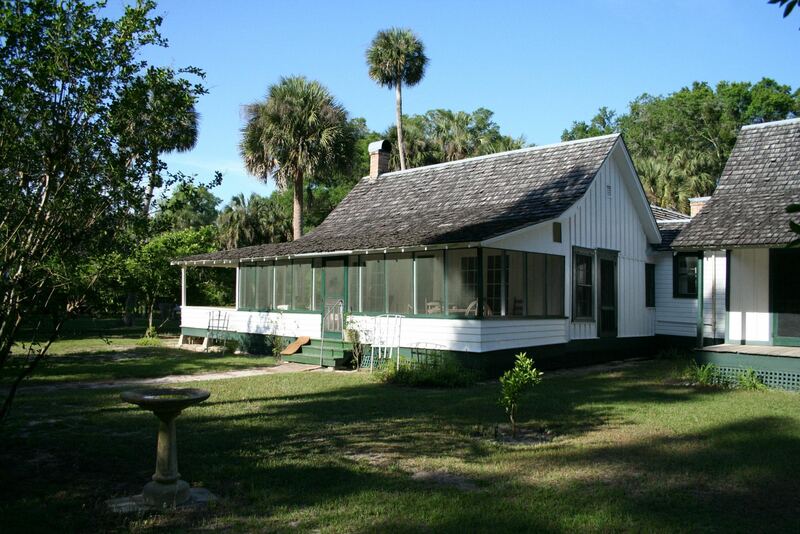 During the first five years Marjorie and Charles lived on the property, it was considered a working citrus farm. 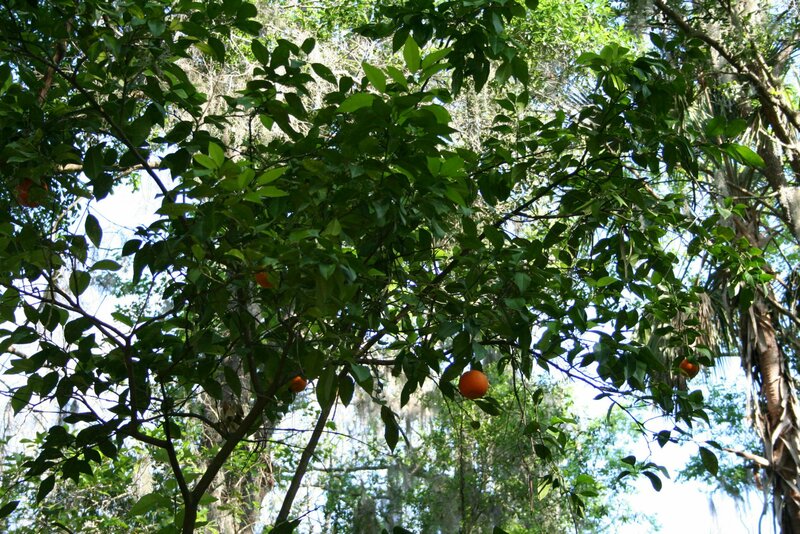 They harvested both pecans and oranges, and at one point in time, the orange grove numbered 3,000 trees. Several freezes over the years eventually wiped out most of the grove. Volunteers regularly plant new citrus trees to replace dead and damaged trees around the house. 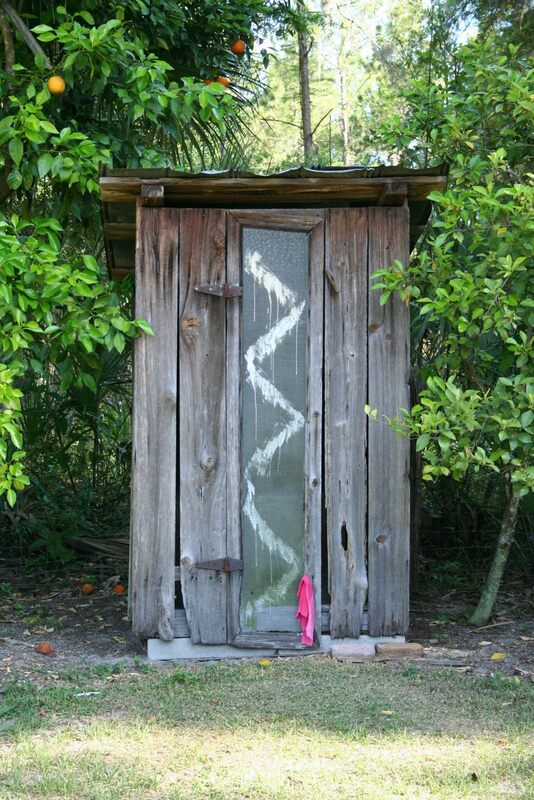 Back in the day, most outhouses were built 50 to 100 feet away from the house. So, when Marjorie had indoor plumbing installed; to include toilets, her neighbors found it a disgusting concept. Well, at least until they understood a new meaning for the word “flushed”. The tenant house is located just south of the main house. Marjorie’s maid, Idella Parker resided in the tenant house during the twelve years she was employed by Marjorie. The original tenant house was demolished in 1969. This house was relocated from an adjacent property in 2002. 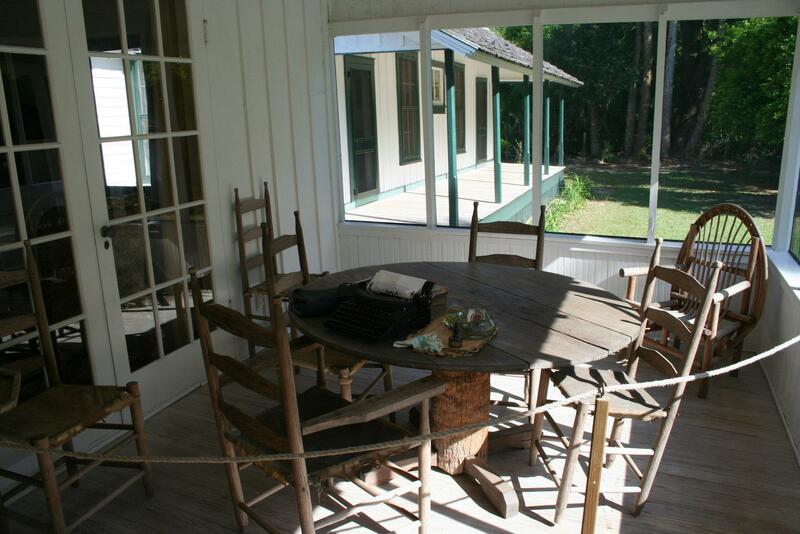 A porch was added so it more accurately resembled the original tenant house. In 1992, Idella’s memoir entitled, Marjorie Rawling’s Perfect Maid was published. Idella resides in Pompano Beach, Florida and celebrated her 98th birthday in April 2012. 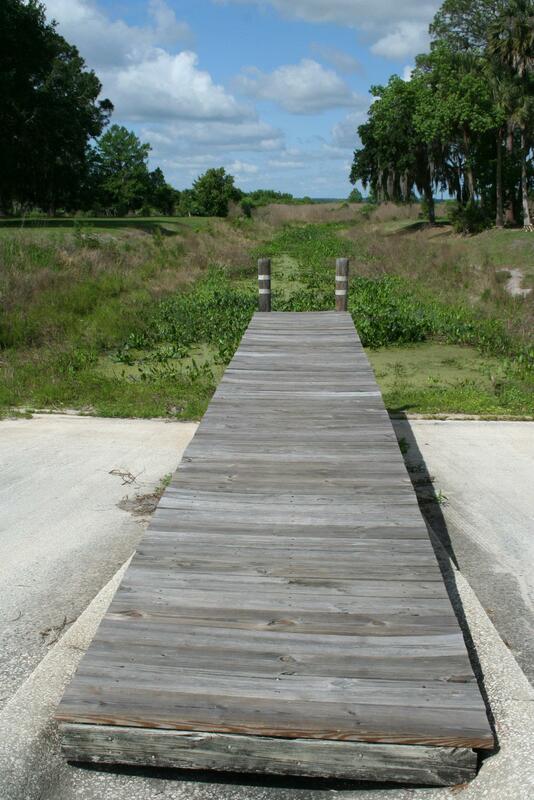 Sadly, this canal, Cross Creek and most of Lake Orange have dried up. 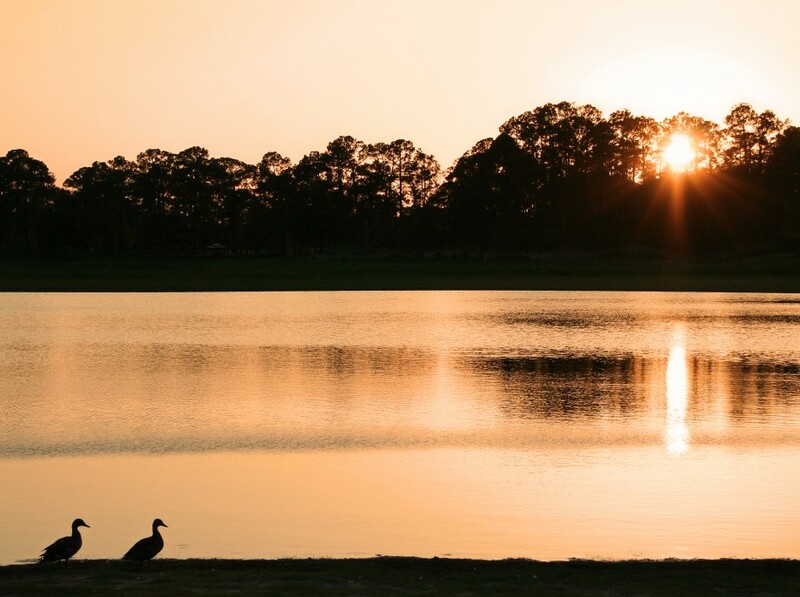 Droughts, development, water diversion and a sinkhole at the bottom of Lake Orange may all be to blame. “It seemed to me that the earth may he borrowed but not bought. It may be used but not owned. It gives itself in response to love and tending, offers its seasonal flowering and fruiting. 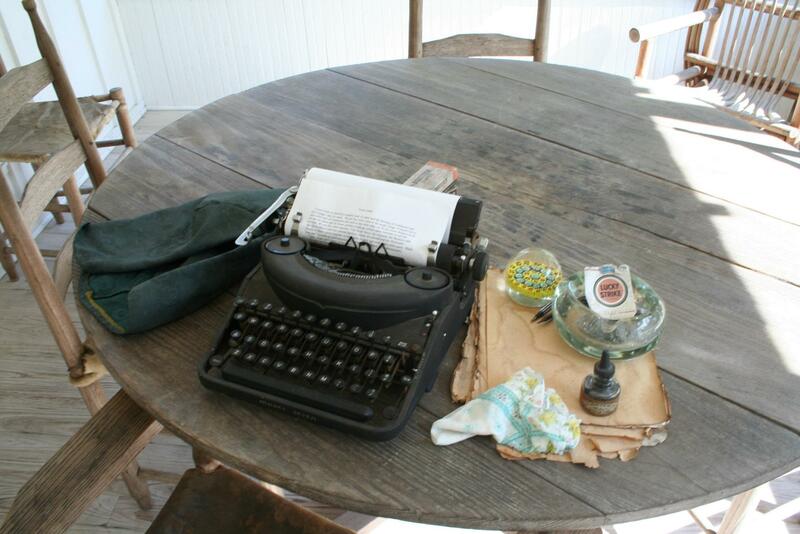 But we are tenants and not possessors…” Prophetic words from Marjorie Kinnan Rawlings.